I very wisely purchased your Destination Kimberley guide and constantly referred to it. We're just back from 3 weeks touring around the Kimberleys driving our Holden Captiva (Series 2 LX diesel) towing a camper trailer (hired from Darwin). Must say I didn't see too many other soft roader AWD SUV's on the road, but the mighty Captiva performed very well. I did fit some Kings springs to it to get an inch or two more clearance (a very good idea) and also got another set of wheels and tyres (Cooper AT3's) that I hoped would last more than a few km's along the Gibb RR, however had a flat in one of the tyres after travelling not very far which took a bit of sorting out. Thanks to the great service at Home Valley Station, we were able to get another tyre sent up from Kununurra and keep to our itinerary. Starting in Darwin, in 3 weeks we managed to get in order to El Questro (2 nights), Home Valley station (1 night), King Edward River/Mitchell Falls (2 nights), Manning Gorge (1 night), Bell Gorge (1 night), Broome (1 night), Kooljaman at Cape Leveque (4 nights), Windjana Gorge (1 night), Fitzroy Crossing (1 night), Kurrajong campground at Purnululu (3 nights) plus a couple of nights between Darwin and El Questro and a night at Sullivans near Victoria River on the way back to Darwin. So a busy trip but did we see some amazing country. Lots of highlights - The #1 as voted by the family (including wife and 14 & 12 year old daughters) was Cape Leveque. Glorious place and could have stayed 4 weeks. Bungle Bungles were spectacular and I thought Echidna Chasm and Cathedral Gorge were pretty special. Best surprise package was Galvans Gorge which the kids particularly enjoyed the swimming and waterfall. The weather was also great (we come from Melbourne) - not enjoying being back in Melbourne's winter weather at all! Lowlight apart from the flat tyre would have to be the Kalumburu road - it was horrid, so it was lucky that the road from the Mitchell Falls turnoff after the King Edward River had just been graded when we drove it and the falls themselves were spectacular otherwise I would question going there by road. Did an heli trip up there which I would recommend. Surprise was how good the Gibb River Road was, particularly after crossing the Pentecost river. By far the worst bit was from the turnoff from the highway after Kununurra to the Pentecost river. I'd happily drive it again. We travelled with friends driving a Prado with the expectation that they would tow us out if we got into trouble. 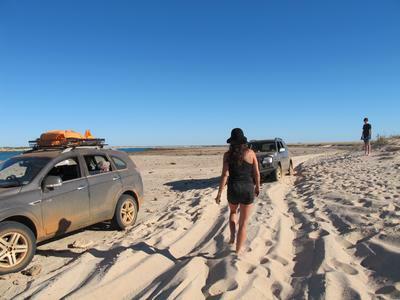 Therefore it was much to our amusement that we rescued the Prado after it became bogged in the sand up at Cape Leveque whilst on Bundy's cultural tour (another highlight) - refer photo. Thanks for all you advice in your guide and on the website, which I studied in detail before heading off. Thanks for writing and for the kind words. Much appreciated. By the way, you are certainly not the first reader to comment how unexpectedly good and easy the Gibb River Road is. Most people feel the same. Glad the Destination Kimberley guide proved useful and that you had such a good time! Did you just fit the springs only? Or did you need to get shocks + camber kit? How did your tyre wear go? P.s. I've had to try and pull my friends Nissan Navara out of the sand before! I just fitted the springs and also got some 17' wheels and cooper at3 tyres. Didn't have any suspension problems and the car is still running fine to this day nearly a year after our trip. I have AT3s on mine also, 235/65/R17 over the standard 235/60R17. Larger rolling radius and actually makes my speedo bang on! Don't hit guards or anything. I was surprised in the Captiva's ability in sand, the traction control works well so I thought if take her further. I've bought the king springs and I'll get them installed next week. I'm sussing custom bash plates just in case. I found a great place. Hi Nigel, anymore pictures of your adventure? Very interested to read your article about your trip in the Captiva along the Gibb River. I have a Captiva which I am thinking of taking along the Gibb in 2017. Did you have to carry any extra fuel for the Captiva given it's 75 litre fuel tank. Its over 3 years since we did the trip in the Captiva and its running very well after 80,000+km. Still traces of red dirt visible - can't get rid of those! As to the question about fuel, my car has a 65lt tank which is somewhat range limiting. We carried two Gerry cans which between them held about 45lt of diesel, so had over 100 litres at our disposal. This was plenty to get from fuel station to fuel station, you just always will up when you pass by one. We were averaging about 15 to 16l/100km towing the camper trailer off the bitumen with 4 of us in the car, so had a range up to 600km. What camper trailer did you tow, as the Captiva has a low towing capacity? I would love to go around Oz in my Captiva. We hired a basic off road camper trailer up in Darwin. Nothing fancy about it compared to the luxury trailers you get these days. I think they weigh around 600 - 700kg, so well within the Captiva's towing capacity of 2000kg.